At Texas Ceiling Fans we carry high quality Tiffany lighting reproductions, manufactured by Quoizel. Qouizel was founded in 1930 in New York, then relocated to Charleston, SC in 1996 to a state-of-the-art 500,000 square-foot facility. Quoizel was grown from a small company to become one of the nation’s leading manufacturers of fine decorative lighting. We have a large selection of Tiffany style lighting in our showroom and we can custom order anything that we don’t have in stock. Come on in and take a look in person at our beautiful Tiffany’s style lighting. 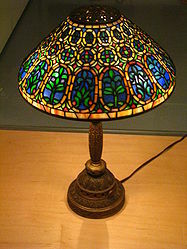 Tiffany glass refers to the many and varied types of glass developed and produced from 1878 to 1933 at the Tiffany Studios in New York, by Louis Comfort Tiffany and a team of other designers, including Clara Driscoll. In 1865, Tiffany traveled to Europe, and in London he visited the Victoria and Albert Museum, whose extensive collection of Roman and Syrian glass made a deep impression on him. He admired the coloration of medieval glass and was convinced that the quality of contemporary glass could be improved upon. In his own words, the "Rich tones are due in part to the use of pot metal full of impurities, and in part to the uneven thickness of the glass, but still more because the glass maker of that day abstained from the use of paint". Tiffany was an interior designer, and in 1878 his interest turned towards the creation of stained glass, when he opened his own studio and glass foundry because he was unable to find the types of glass that he desired in interior decoration. His inventiveness both as a designer of windows and as a producer of the material with which to create them was to become renowned. Tiffany wanted the glass itself to transmit texture and rich colors and he developed a type of glass he called "Favrile". 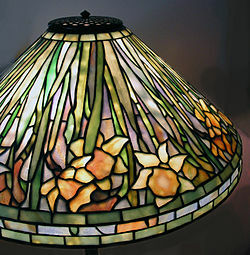 The first Tiffany lamp was created around 1890. Each lamp was handmade by skilled craftsmen, not mass- or machine-produced. 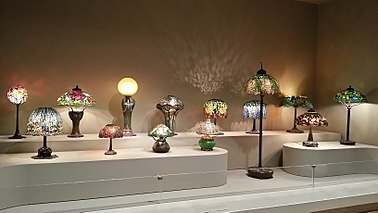 Its designer was not, as had been thought for over 100 years, Louis Comfort Tiffany, but a previously unrecognized artist named Clara Driscoll who was identified in 2007 by Rutgers professor Martin Eidelberg as being the master designer behind the most creative and valuable leaded glass lamps produced by Tiffany Studios. Tiffany's first business venture was an interior design firm in New York City, for which he designed stained glass windows. Tiffany lamps gained popularity after the Worlds Columbian Exposition in Chicago in 1893, where Tiffany displayed his lamps in a Byzantine-like chapel. His presentation caught the eye of many people, most notably Wilhelm Bode and Julius Lessing, directors of state museums in Berlin. Lessing purchased a few pieces to display in the Museum of Decorative Arts, making it the first European museum to own Tiffany glass. Though Tiffany's work was popular in Germany, other countries, such as France, were not as taken by it because of its relation to American crafts. Tiffany was only able to break into the French market by having the production of his works taken over by Siegfried Bing, with the assistance of many French artists. Without Bing’s access and contacts in Europe, Tiffany would not have had as much success selling his works to a European audience. Tiffany’s success throughout Europe was largely due to the success of his works in the German and Austro-Hungarian markets through a series of exhibitions beginning in 1897 at the International Art Exhibition in Dresden. After the partnership between Tiffany and Bing ended, interest in Tiffany products began to slowly decline in Europe. The glass was manufactured at the Tiffany factory located at 96-18 43rd Avenue in the Corona section of Queens from 1901 to 1932.